I had no idea such a wonderful program as Hope Scarves existed until the daughter of a friend of mine sent me one. Amy Keller, a Louisville gal and mother of two young boys, was just finishing up her own battle with breast cancer when she heard of my relapse. Receiving the beautiful scarf from Amy was like an infusion of hope from a fellow traveler. Reading the online stories of so many young women who had fought and succeeded in their battle against cancer was tremendously encouraging. The scarf was also a conversation starter at the gym, supermarket, and church helping me connect with others who had been in my shoes or knew someone who was. Of course, my family, friends, and my amazing dog, Emily were an invaluable source of support for me along with the wonderful staff at the Emory Winship Cancer Center here in Atlanta. Every test, statistic, and treatment were thoroughly explained with all their pros and cons. I think we’re all lucky to live at a time where we no longer blindly follow a medical protocol, put are partners in our treatment and recovery. Knowledge really does give one a sense of power. I finished my last chemo in November and since then have been taking an aromatase inhibitor. I will take this for five years or longer perhaps. The side effects are not too bad, fatigue and sore joints, but if they keep another recurrence from happening I’ll be thankful. I’m back taking long walks with Emmie and swimming about 7 miles a week. For me exercise has been a wonderful healer, especially of the mind. I think I would like others to know that there is this wonderful small gift of Hope scarves that they can send to a friend or even acquaintance that just “says” it all. When one’s own words won’t suffice, the stories of other Hope Scarf recipients can be so comforting for the cancer patient. I would like to give Mt. Kilimanjaro one more try. My first attempt at age 22 ended with me stricken with altitude sickness about 500 feet below the summit. Impatient and compassionate (according to my husband). Life is fleeting. Make every day count. Do something for someone else!. A roller coaster of emotions… ending with good news! Today was an emotional day to say the least. I spent the morning with Bennett in his kindergarten class, just sitting in wonder of the little miracle who I felt kick inside me the first time I heard the words, “you have cancer.” So filled with joy to see the kind, smart, witty little boy he has become. Then, I went to say farewell to my friend Sandra. It was hard to look at the smiling pictures of her throughout her life and listen to people talk about how unfair this disease is and how quickly it spread throughout her body. 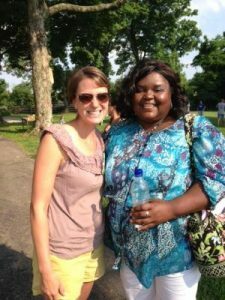 As my body trembled I focused on the example she was to me and so many others about living each day to the fullest. Then Jay and I went to my PET scan. Luckily we have a dear friend who is a radiologist so we had our results quickly. The scan revealed that there is NO PROGRESSION. No new spots of cancer. The spot in my sacrum is still there- which is to be expected. But, no growth beyond this spot. We are so happy to be blessed with this news. 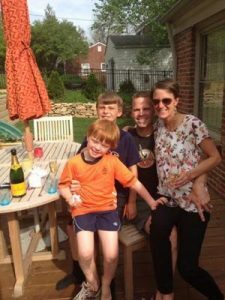 We sat on our deck with a bottle of our favorite champagne and toasted today. Today we laughed and celebrated this good news. We don’t know what the future holds, but on this roller coaster I am learning you have to celebrate each moment of good news. Now, back to life. No more living in fear of this test or if each ache and pain I feel is a new tumor. I have a lot of living to do and I hope the news from todays scan will bolster my resolve that I can live with this disease. This new reality is crazy. I will have another scan in 3 months. We will monitor things closely. I will continue with the treatment I am on – monthly injections of xgeva to strengthen my bones and daily medications to block the estrogen remaining in my body despite removing my ovaries. Side effects are minimal and manageable. Really the hardest for me has been the lack of energy – for those who know me, you know I am used to doing 100 things in a day. But, I am adjusting. Thank you so much for all your prayers and encouragement and positive juju today. It was such a roller coaster, but I am so happy to say that today the ride ended on a high. I hope I can share many more happy moments and good news with you! My heart is heavy as I reflect on the life and loss of my friend Sandra Fleeks. I met Sandra several years ago through our young survivors group and was immediately touched by her sweet kindness. She graciously faced metastatic breast cancer and many side effects for two years, but you wouldn’t know it. She always had a smile on her face and time and love to share to help others. Sandra died yesterday… and my heart goes out to her friends and family. Sandra was an active community member, volunteering for many organizations around town. We were lucky for Hope Scarves to be one of them. She was our February Face of Hope, you can see her profile here. https://hopescarves.org/face-of-hope-february-2014-sandra/. She was also a scarf and story donor and usually one of the first to answer my request for help from survivors at public speaking events, booths or a special event. I tremble as I face the same disease that she fought for two years and ultimately robbed her of a long, complete life on Earth. I know she is at peace now and free of the pain she was feeling. But, I am so angry at breast cancer. I am so angry that this disease kills so many women each year (41,000) and that over the past 30 years although the “awareness” and “pinkness” has increased exponentially, the death rate has basically stayed steady. I pray for advances in medicine and that we really, really might actually be able to find a cure to this awful disease so that no more children have to lose their moms. Selfishly, especially mine. Peace be with Sandra’s family and may we carry on a little bit of her kind, gentle ways in the work of Hope Scarves. Thank you Sandra for showing me how to be brave. Tomorrow will be an overwhelming day. I will be attending my friend Sandra’s visitation with several other friends from Hope Scarves. I look forward to telling her mom and daughter how much she meant to me as an example of how to live with stage iv breast cancer, not hide from it or dwell in the sadness. Yet, I know getting these words out is going to be very hard. So, tomorrow I am starting my day in kindergarten. I was trying to think where I would want to be to feel happiness and joy on this hard day. I’m pretty sure Second Pres Kindergarten is one of the happiest places on Earth. So, I’m going to spend the morning with Bennett and his friends – surrounding myself with the laughter, optimism and hope that 5 & 6 year olds bring to each day. I will post an update after we know the results from my PET scan tomorrow afternoon. I am hoping for the best but also preparing for the idea that even if there is progression that doesn’t mean there isn’t additional treatments we can try. We are at the beginning of this journey. I am starting to figure out how to travel this new path. Tomorrow will be the first of many scans and accompanying anxiety. And, unfortunately, it won’t be the last funeral I attend for a friend facing this disease. This is the journey I am on. I thank you for walking beside me and helping me along the way. It means a lot to me to share my story and that you care to listen. I so hope I post some good news tomorrow afternoon. This past weekend was a beautiful weekend in my life and for Hope Scarves. 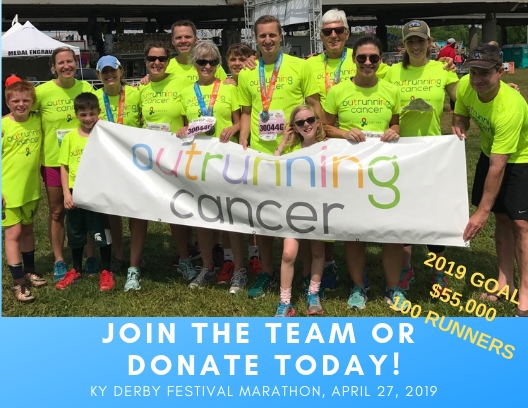 Our first Derby Festival marathon team competed with 16,000 other runners as team “Outrunning Cancer!” Our team was made of 80 runners from across the country who together raised over $23,000 to support the mission of Hope Scarves. We had the most runners and raised the most money of any first year charity! The energy of the weekend was amazing. We kicked off race weekend with a pasta dinner for around 200 people and celebrated the top fundraisers and the women we were running for. Race day was a beautiful morning and our team was so full of energy and determination. We had runners who ran farther than they ever had before, several who set new PR’s and many who ran in honor of loved ones. My favorite story is how one of our team members wore her mothers scarf, which she received from Hope Scarves during her treatment. Her mom was smiling from heaven for sure as her daughter ran in her honor. I was part of a relay team and when my friend Tom handed me our timing chip I just took off running. I wasn’t sure how long I could do it, but I put one foot in front of the other and ran… I ran the whole 3 miles! With tears in my eyes and joy in my heart. It felt so good to run! (It has taken me a couple days to recover from this adrenaline driven spontaneous pace, but my soreness was just muscle pain, not bone pain and I am doing much better now!) 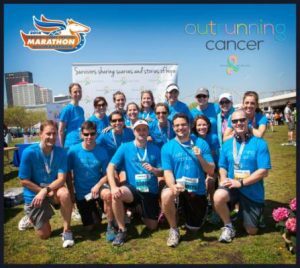 I loved crossing the finish line with our family and friends and seeing the bright blue outrunning cancer shirts throughout the course! Thank you to everyone who is part of our team and worked so hard to collect donations for Hope Scarves. Thanks to those who donated and all the volunteers who helped make the weekend possible. Special thanks to my family for being by my side through the good and the bad, for running and walking and cheering and laughing and crying together. I am so blessed. We are outrunning cancer not to run away from it, but to run faster and stronger than it. We don’t know how long this race is, what the terrain involves or what obstacles lie in our path. But, we will run strong and brave and hopeful! And hopefully someday we will run right into a cure.